Spiders dare upset my equilibrium by their very presence. 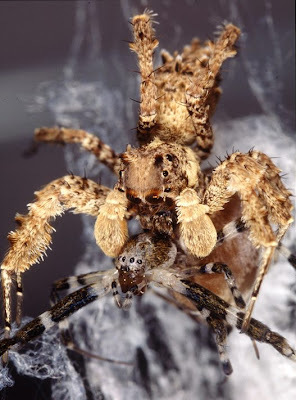 So you can understand what wicked glee I find in seeing their demise, especially at the hands of jumping spiders (some of my favorite creepy crawlies). Here's a Portia sp. getting the jump (literally) on another spider. And how about the photo below? That's right, it's a cricket eating a spider. 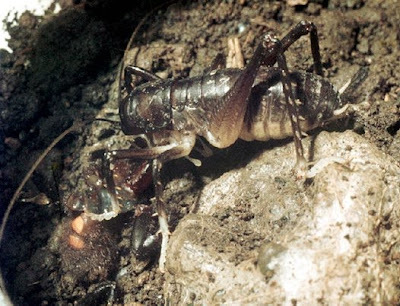 More specifically, a king cricket that has overpowered and decided to dine upon a funnel web spider. How's that for upsetting the perceived natural order? Thanks for the photos, Annie. Go cricket! It's payback time!